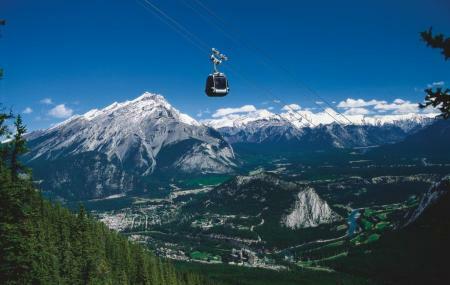 The Sulphur Mountain is just a gondola ride away from the city of Banff located in the Banff national park. During this ride you get the magnificent view of the Banff, Rundle, Lake Minnewanka, the bow valley and other famous view points. The mountain trail can get a little exertive but is sure to be worth all your time and energy. The gondola ride down the mountain is free during winter. The trail is steep and gets slippery during spring and fall. How popular is Sulphur Mountain? People normally club together Whyte Museum Of The Canadian Rockies and Sunshine Meadows while planning their visit to Sulphur Mountain. Beautiful place to take people to a top of the mountain. Don't worry if it is cloudy day and the clouds are low, you'll likely punch through the clouds and be treated to stunning "island" views of the mountain tops. From Nov to end of April you can hike up the mountain and take the gondola down for free! Really well developed facility with interactive displays and short movie in a dedicated theatre. There is a large souvenir shop and two eating establishments. One is buffet style and another is a Bistro with table service. Prices are a little high (as expected). But the experience is fantastic. There is a board walk that is about 1km but only the beginning portion is accessible by wheelchair. There is also a top level observation deck that has a couple fire pits with chairs to enjoy the view. If you are able to do the hike (moderately strenuous as there is several hundred meters of elevation gain over an approximate 6km hike) and take the gondola down during the winter season it is a fantastic way to see the mountain top and not have to spend a lot of money to do so. An attraction worth seeing! We don't hike much and it was for sure moderate-hard but we were able to do it with normal hiking boots! It took us about 2hrs. The trail is beautiful and view at the top stunning! Hiking down I recommend a walking stick or poles as more slippery/slushy. Was an easy hike with lots of switch backs. Views are great and has a nice place at the top for coffee. Amazing views. Our family had a great day. The trail is a little arduous for an amateur. Every bit worth taking the hike-up, with scenery, weather changes and some animal life. We came across a gorgeous golden mantled ground squirrel. The 360 views from the top are unworldly beautiful. The landscape is still pristine. Its getting busy and touristy out there! It turns dark quickly. Consider taking gondola on your way down.